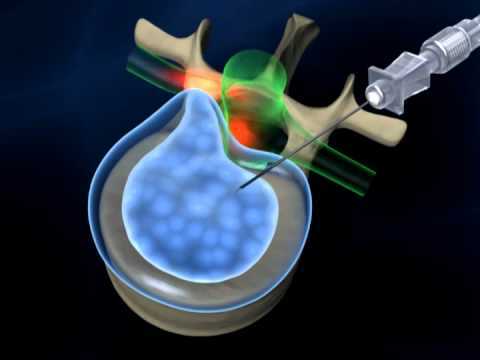 Percutaneous Disc Nucleoplasty therapy is designed to reduce the tissue volume of the spinal disc by evaporating part of the liquid core, this lowers the pressure on the walls of the spinal disc, which in turn reduces the painful protrusion of the disc. The pain related to bulging spinal disc walls will subside after the procedure. Percutaneous Disc Nucleoplasty is minimally invasive surgery to reduce the volume of a bulging or herniated disc. In both cases the spinal disc puts pressure on a nerve root or the spinal cord and causes back pain or sciatic pain. Many patients with back pain show no clear indication of a herniated disc. However with MRI investigation protrusion of the intervertebral discs can be diagnosed. This protrusion can put pressure on nerves or the spinal cord and can cause persistent, or stress-related chronic back pain. Normally this kind of back pain (lumbar or cervical), responds well to conservative treatment options.Nucleoplasty, as a minimally invasive treatment, covers only smaller disc herniations or disc bulges that have not yet broken through the solid fibre ring of the disc and are therefore are not accessible via an open surgical procedure (surgical removal of the disc material).Internationally, more than 200,000 patients have already been treated with nucleoplasty, with a greater than 80% success rate. Endoscopic Nucleoplasty is safe for patients and is a minimally invasive procedure, which produces very good outcomes, without the risks and postsurgical complications associated with open back surgery. Consult Spinomax Pain & spine to find out if you are right candidate for Nucleoplasty treatment.